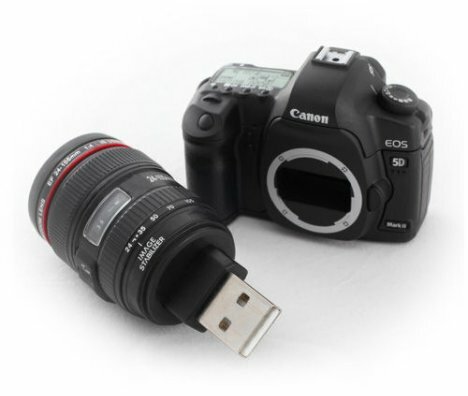 Canon 5D MkII Flash Drive | OhGizmo! By Evan Ackerman on 03/30/09 • Leave a comment! A week or so ago, we wrote about some little miniature camera toys that you could get as prizes in Japan. They were cute, but they didn’t do anything. This tiny model of a Canon 5D DSLR actually does do something, with a 4 gig USB flash drive hidden inside the lens, which is a decent enough 24-105mm f/4 IS. ‘Course, if you want to store your files in high quality, you’d have to find yourself a Nikon D3X flash drive, instead. These Canon 5D flash drives pop up on eBay for a totally ridiculous $100 and up, but if you can afford a 5D, you probably won’t care.